Anyone can say “I love you” or play a recording of a favorite song – but not everyone is romantic (or geeky) enough to present their beloved with a physical representation of those sounds. 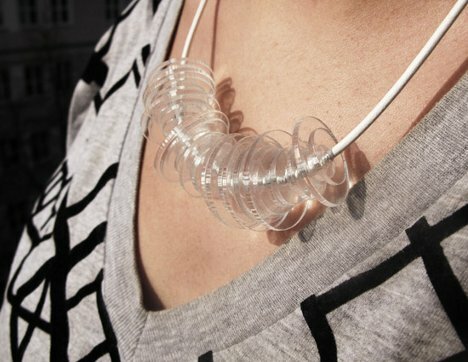 The Waveform Necklace from Berlin-based designer David Bizer translates a short audio clip into its visual wave pattern. Each portion of the pattern is represented by a thin wafer of plastic, metal or wood. 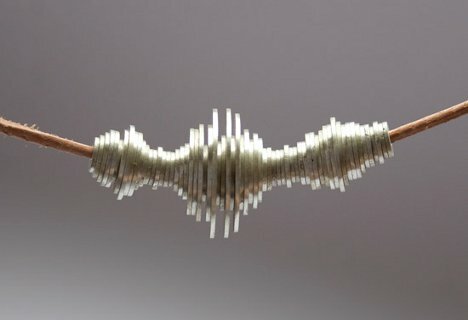 The pieces are strung together on a cord in order to recreate the sound wave pattern. Bizer recommends using a short bit of speech or a brief audio clip with words to keep the pattern interesting. Prices for the customized jewelry pieces start at €29 (about $36 US).